Homophones, sometimes known as ‘confusables’ are words which have a similar sound but differ in spelling and meaning. Examples of homophones include ‘there’ and ‘their’, ‘where’ and ‘were’ and so on. With over 400 homophones in the English language, similar sounding words add depth to a language but they can also be the cause of great frustration. Spell checkers can’t even be relied upon where these troublesome homophones are concerned. How can Penfriend provide support with homophones? The problem with most homophones is that if you’re typing too quickly or not paying close attention to what you’re writing, you could accidently end up with a properly spelled word, except it’s the wrong word. Confusables are often highlighted by dyslexic people as a source of annoyance and confusion. With Penfriend’s new option ‘Confusable word hints’ (go to View and Preferences) you can now see and even hear the difference between confusable words, so there’s no excuse to get ‘pair’ and ‘pear’ or ‘bear’ and ‘bare’ mixed up anymore. Visit the Penfriend website to download the latest versions of Penfriend. We also have some new exciting products in the pipeline – so keep checking the blog to find out more or alternatively follow us on Twitter and on Facebook. And don’t forget, the Penfriend blog looks great on the iPad! The following video screencast tutorial shows you how to save a personalised lexicon which can be used in different contexts, such as colour background, speech or a lexicon which contains a specific word list. With Penfriend it couldn’t be easier to change the lexicon you want. Penfriend’s easy-to-use interface makes is user friendly and very accessible. As this tutorial shows, it’s just a case of selecting the lexicons you want to use then simply drag and drop each lexicon into the Prediction window. I’ve used Penfriend NA with the Katherine (East Coast America) voice to demonstrate but as you will see, you can change the style of voice by simply changing the lexicon. As well as Penfriend NA, Penfriend is available in French, German, Spanish, Swedish, Italian, Portuguese as well as UK English and Scottish Gaelic. Penfriend features a powerful screen reading option which reads text in documents and other Windows applications such as email, web pages etc. 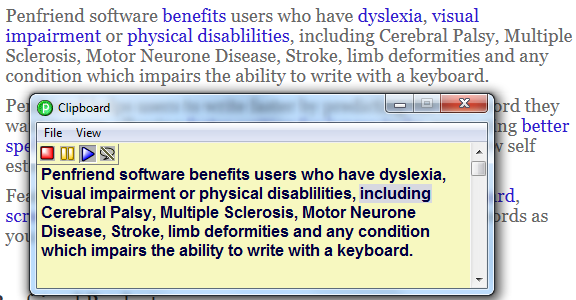 When the mouse is placed or hovered over text, icons or menus Penfriend will read the information back to the user. Although Penfriend’s Screen Reader is a very empowering tool, when combined with the Clipboard Reader and set up to meet individual needs, Penfriend can be extended into a tool that can benefit users with a visual difficulty. The following video tutorial explores how Penfriend can be set up to read text and other elements using the Screen Reader, the Clipboard Reader in combination with a high contrast viewing style. If you would like to try this out for yourself, remember to select ‘File’ and ‘Save Lexicon’ or ‘Save As’ to save your settings. This means that you only need to set your preferences once as Penfriend will automatically save your personal settings including the words in the lexicon. As well as standard word processors and text editors such as Microsoft Word, Wordpad and Notepad, Penfriend will also work alongside online word processors and text editors, in particular Google Docs, Microsoft SkyDrive, Twitter and Facebook. So if you want to get in touch with friends via Facebook, or post a tweat on Twitter or even share a Google or SkyDrive document, then Penfriend will make the process so much more easier, particularly if you have dyslexia or a motor difficulty and find typing difficult of impossible to do. This short video highlights how Penfriend can work alongside a range of online applications. It is without doubt that Penfriend offers some great features, particularly for those users who need to customise the look and feel of Penfriend. For example, the Penfriend prediction window can be customised by changing the font style and size as well as font and background colours. This is of course very useful for people who experience Scotopic Sensitivity and suffer from visual stress. While Penfriend offers these great features they don’t always come as default in your favourite word processor or web browser. It is often the case that you need to dig deep into your computers’ settings to make changes, particularly to help with tracking and colour preferences. RapidSet running alongside Penfriend - changing colour preferences. Well here at Penfriend we have some great free software to help you quickly and easily make the changes to your computer exactly as you want them. We have some great free software for you to download and use alongside Penfriend. Whether it’s colour background preferences or tracking the movement of your mouse cursor – we have solutions to help. To find out more visit the ‘Free Software’ section of the Penfriend blog. And don’t forget to visit the Penfriend website to download the latest versions of Penfriend. 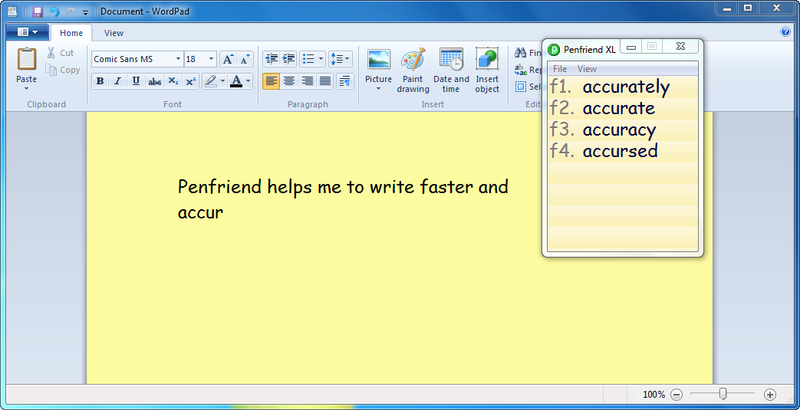 Penfriend's Clipboard with text-to-speech support. From a Secondary Teacher, Scotland. R got a grade 1! He is sitting Higher English this year, using Penfriend, but obviously needs the bigger lexicon that XL provides. One of the good things about his exam result is that the younger boys in the school who are using Penfriend can now see that their dyslexia does not need to be a barrier to achievement, and it has really motivated them to stick in and persevere with the software. Have your say and win a Penfriend XL Portable! Penfriend’s on-screen keyboard – new features!